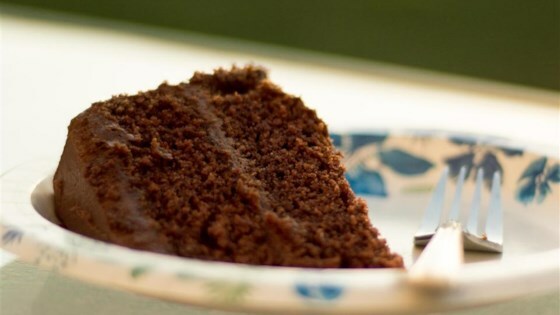 "This chocolate cake is an adaptation of a cake I ate as a child. It's easy, moist, and delicious! I have successfully substituted egg-free mayonnaise for the regular mayonnaise, if eggs are off your list, too. Frost with your favorite chocolate frosting." Preheat oven to 350 degrees F (175 degrees C). Spray two 9-inch cake pans with cooking spray. Combine flour, sugar, cocoa powder, baking powder, baking soda, and xanthan gum in a bowl; stir in mayonnaise until well mixed. Gradually pour in hot water and vanilla extract; stir until smooth. Spoon batter into the prepared cake pans. Bake in the preheated oven until a toothpick inserted in the center of the cake comes out clean and the cake slightly pulls away from the sides of the pan, about 30 minutes. Cool in the pans for 10 minutes before removing to cool completely on a wire rack. Two mini fluted tube pans, 1 9x13-inch baking pan, or 24 muffin cups can be used instead of cake pans if desired. Loved this recipe! A friend is gluten intolerant, but loves her desserts. This is a wonderful way to give her both. I cooked in as a bundt cake, and served it with a homemade mango frosting.